With the BMW BERLIN MARATHON 100 days away, race director Mark Milde announced the return of marathon world record holder Haile Gebrselassie to the streets of Berlin. Here the Ethiopian superstar of long distance running had his greatest success as a marathon runner winning four times in a row between 2006 and 2009 clocking the world marathon record twice (2007 and 2008). His record time of 2:03:59 hrs still stands to day as the mark to beat. “I love the Berlin Marathon. 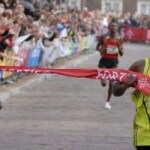 The crowds are phantastic and on a good day everything is possible on this extremely fast course,” Gebrselassie said. Haile Gebrselassie wants to qualify for the Ethiopian squad at the Olympic marathon in London next year. The last marathon he completed was the 2010 Dubai Marathon (2:08:09). Last November he dropped out of the ING NEW YORK CITY MARATHON after 25 kilometres with knee problems and announced the end of his running career. Shortly thereafter he stepped back from his decision and announced to run the Tokyo Marathon in February. He had to skip this race though after he fell on a training run and hurt his knee. In April he happened to be in shape again by winning the Vienna City Half Marathon. In May he won a 10 k road race in Manchester (England) in 28:10 min. In the women’s race Irina Mikitenko is back again on the course where her marathon career had started in 2007. In the following year she clocked 2:19:19 hrs here for a course record making her the fourth fastest woman of all time. In 2008 and 2009 she won the World Marathon Majors series of marathons (Boston, London, Berlin, Chicago, New York City, Olympic Games and World Championships). In 2010 she was handicapped by an injury dropping out at the Virgin London Marathon in the spring and placing 5th at Chicago in the fall. Last April she ran 2:24:41 for seventh place in London after running most of the distance on her own. In Berlin she wants to qualify for the Olympic marathon 2012 in London. The BMW BERLIN MARATHON is sold out since February. Registration had started October 18th. The participation limit is set at 40.000. Entries for the Inline Skating Marathon on Saturday, September 25th are still available. Accreditation is possible starting August 1st (until September 9th). The BMW BERLIN MARATHON will be televised live on n-tv nationally for four hours and on Eurosport from 9 until 11.30 a.m.